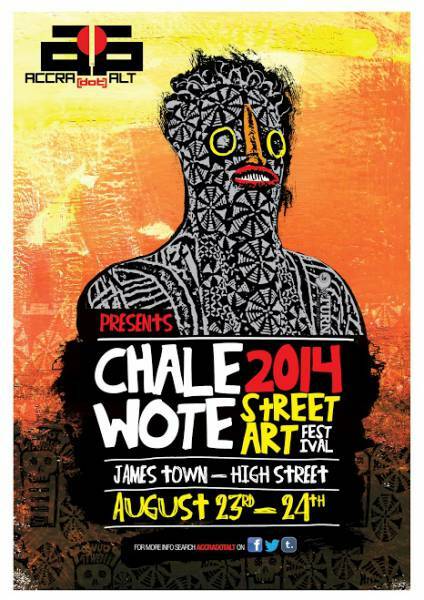 The fourth annual CHALE WOTE Street Art Festival takes place in James Town on August 23rd and 24th 2014. CHALE WOTE is produced by ACCRA [dot] ALT and a host of collaborators across the city including the Accra Metropolitan Assembly, Redd Kat Picutures , Institute Français, The Foundation for Contemporary Art – Ghana, Dr. Monk, No Limits Charity and The Attukwei Art Foundation. The third edition of the CHALE WOTE Street Art Festival held on September 7th and 8th 2013 was a major success and the collective effort of many young people-ranging from artists, musicians and writers to designers, students and activists-who worked together to produce West Africa's only street art festival. The two-day festival included graffiti murals, film screenings, Theater, installations, live music performances, a fashion circus, extreme sport stunting, dance, spoken word and art workshops. The festival drew over 3,000 people last year; a lot more people are expected to attend this fourth edition. CHALE WOTE 2014 welcomes installation projects by internationally acclaimed participants – mixed media/visual artist Rasik Green [Johannesburg, SA], dance performance artist Yinka Esi Graves [US, theater performance artist Florine Demosthene [Brooklyn, NY USA], visual and installation artist Charlotte Chapman [UK] and Edwin Sacasa [US] are amongst the visiting artists creating at CHALE WOTE this year. We are working in collaboration with more than a dozen organizations across the city to produce CHALE WOTE 2013, including Foundation for Contemporary Art-Ghana, Institute Français, Absolut, Redd Kat Pictures, CHALE, Dr. Monk, Afrogallonism, Citi FM, Radio XYZ, Millennium Cities Initiative [AMA Project Managemen and Unit]. Contact festival operations office, @ accra.alt@gmail.com or call 0200293521 for more information and updates.